Our sailing friends on Desiderata gave us their luxury cabin for a week while they traveled and all we had to do was play with their cat. Not a bad deal because their cool cabin is about a block from the lake and is surrounded by monster trees. They gave us some good hiking tips and let us use their bikes. The only downside is at times the temperature is in the low 30's! We've been trying to get used to actually being cold, but the freezing part is asking too much. We did a lot of hiking and a friend from when we used to work at moto came to visit too. One of the hikes we did together had a great panoramic view of Tahoe. We also hiked through some snow fields, but that alien substance was a bit too cold for our tropical blood. After enjoying "our" vacation home we hung out for a few more days to visit with everyone and we did some more hikes. One of them was up to a nice lake where even Hopper went swimming. We also got watch some fun baseball games, went out for dinner and spent a lot of time swapping stories because we haven't seen them for almost two years. While we are still stuck in cruising mode, they have adapted well to modern life again and are having a great time living next to the lake, skiing all winter and hiking the forests in the summer. We even went to the beach together like old times, just no surfing and the water felt refrigerated. Despite their best antics they couldn't sucker us into that ice water. Now it's time to say goodbye (yet again) and hit the road. We are headed towards a place called Lassen National Park (most of which is still closed due to snow) to see what we can find there. Three days in Yosemite was not nearly enough time. The waterfalls pouring over sheer granite cliffs reminded us of the fjords in Alaska and Northern Canada. There was so much snow that the upper campsites were all closed and Half Dome still didn't have cables installed for climbing. Because of the limited number of campsites, and the fact that we didn't have reservations, we had to play the daily game of getting on the waitlist at 8am (which meant being in line by 7am)and returning by 3pm for the site assignment. This limited us to about 5 hours of hiking each day, but we always managed to get a site. The Yosemite Valley is run a bit like Disneyland with lots of crowds and people who don't seem to know how to enjoy the wilderness with their cell phones, mp3 players and all the park services (swimming pool, restaurants, stores, tram rides, etc.) This aside the scenery is fantastic and it is impossible to take a bad photo. Here's a slide show of our 3 day trip of some of the cool places we hiked/drove. My sister Kate has been in school for over two decades. I can't fathom how she did it. Her accomplishment is even more impressive because she completed the college portion all on scholarships. Family members from all over the country as well as from Singapore and Mexico, drove or flew to LA to share in the celebration. 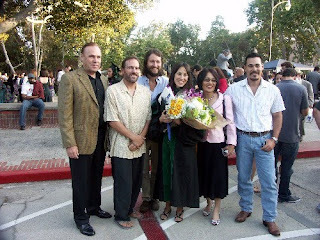 On June 4th, Dr. Kate Baicy, MD PhD graduated from UCLA Med School with a concurrent PhD in Neuroscience. Oh, and we had the additional celebration of her marriage to Michael Tapper, who has been with her since the early days of grad school. They had a simple and private ceremony in Hawaii on May 14th. For Kate, this is just one break in a long and difficult road. At the end of this week, she will be moving to New York where she will begin the intensive underpaid work as a Resident at NYU, in Obstetrics/Gynecology. She will be working at Bellevue Hospital where she will work a required 80 hours a week for 4 years, in a stressful environment with someone watching and critiquing her every move. What really brought us to this day was not Kate's graduation but Kate. In her humble and quiet way was hidden a powerful mind and spirit. There were so many ways things could have gone wrong for her, when it was easier to give up, to do something else, to just quit. However she found something she loved and in the process she began to discover herself and her own abilities. Patients will be lucky to have Dr. Kate Baicy with her string of alphebetic letters behind her name on their side. Lucky not because she has a fancy degree from a highly respected medical school, but because of who she is. She cares, listens and understands, then puts her mind and soul into helping and learning. She will be working as an OB/GYN in both private and public environments for NYU, the hospital's affiliate university. Bellevue Hospital is the oldest, and one of the largest public hospitals in the country, with a private hospital attached. Kate will see cases from all over the world and learn how to cope with a huge spectrum of problems ranging from language barriers to rare illnesses. Bellevue is also the home of the US's very first maternity ward, so Kate will be at the start of it all. While I was absent from much of her life, I am so happy we could be here and share this day with her. Enough about that...photos! Kate and her new husband Michael! We spent about a week with our friends Robert and Liz and their family in Phoenix. Where they had the pleasure of helping us after we broke down about a mile from there house! Hopefully the new fuel pump and filter will fix the problem as the old pump was the wrong size and I don't think the fuel filter was ever changed. Anyway I think we mananged to successfully lower the properity values of most of the neighborhood before we left. The desert park was in full bloom with lots of flowers and bright colors. I don't know how we got so lucky. There are also several oasises deep in the desert with lots of animals and no one around. If we had more time we probably would have done some of the longer hikes, but we got to see a good portion of the park. We left Huatulco and found a nice beach town called Zipolite. Within yards of the beach we parked our beast and took the cat for a walk. It was a beautiful place with powderlike sand. We spent a quiet night there and an early morning fixing stuff on the RV. Our goal was to make it to another beach on the other side of Acapulco. But after leaving the town of Santiago Pinotepa Nacional our engine acted up. We noticed a relay had been clicking on and off about every 5 seconds and I tried to locate it, but with no luck. Outside of town in the middle of nowhere the engine died. Totally dead, no spark, no go. Fortuantely this didn`t happen on a blind curve. I was able to coast to the only pull-out for miles. I still couldn`t find the problem so we let it cool off and it started fine. So we turned around to buy some parts to jumper in a relay. After getting the parts we went to get some cash but the ATM machine ATE my card!! The bank couldn`t do anything until the next morning. So after watching the military raid a hotel and block off the street, then getting kicked out of a Pemex (mexican gas station which normally lets people park overnight) by a rude old dude, we finally found another Pemex whose guard even offered to keep an eye on us during the night. We waited most of the next day to get our card back only to discover it was EXPIRED. It would have been nice if the machine had at least told us why it kept our card. On the way past Acapulco the engine clicking wouldn`t stop. Fearing another engine failure on a blind curve in the middle of nowhere, we sucked it up and skipped the bypass and plunged headlong into the road nightmare that is downtown Acapulco. Acapulco has become the slum town of Mexico. There is no other way to say it. We found a little RV park that was totally run down but was right near all the auto repair places. The next day we found this guy in an dusty lot and a small cinder block room with "Electrico" on the side. Not holding out much hope, we pulled in. The owner wanted to buy our RV, but his mechanic and I ignored him as we poured over the engine, which refused to reproduce the problem. At one point I got so fed up I started moving and pulling things randomly until a large spark shot out of something and the CLICK of the ignition coil relay caused me to excitedly shout "Eso es la sonida!" We traced it to a bad diode that was shorting to ground and killing the power to the ignition relay. I was shocked when the mechanic reappeared 10 seconds later from behind the concrete hovel with a brand new version of this chassis mounted toyota diode. $22 later we were back on the road and better than new. Our next stop was Playa Linda which is a spot we surfed 3 years ago with some other boats just outside of Ixtapa. It was so quiet and relaxing parked next to the surf. We slept hard knowing the WTM was running well again. The next day we wound our way up the coast to a funky little RV park/restaurant/mini-store on the beach. We were the only ones there.... Jordan went bonko in the bushes and ended up covered in stickers. So today we decided to go a short ways to Maruata. Wow is it beautiful. We are parked right by the main beach (i.e. free) with fantasic sand, clear water, cliffs and reefs all around. Jordan is getting better at walking on her leash as you can see in the photos. Our short list of things to "fix" on the RV turned into about 3 weeks worth of work. We found some sections of dry rot and had to remove several areas of the inside roof and replace two roof vents. This took a lot of time but the job was cheap and easy. Now the inside looks really good with new paint and roof fixtures. We also added a solar panel to keep the White-Trash-Machine green. And we put in an invertor for using AC power. We also went through all the equipment and got everything working, from the fridge to the water heater. We even added a water filter so Sherrell can have her good tasting water. Our plan is to spend a couple of days actually living on the WTM while "putting the boat away" for the summer. After 7 years this will be the first time we've left SARANA alone for more than a month. Fortunately, there are several people here to keep an eye on it for us. So we should be checking out the surf spots by next week and slowly working our way north along Mexico's coast. I'm sure you're wondering why we've been so silient. We decided to tie up in Huatulco, Mexico this summer and go see our friends and family in the US. To do this properly (i.e. bring the cats) we needed wheels. In addition to prepping Sarana to be alone, we have been researching RV's. Yes a full-on beater white trash machines (read: cheap). We found a class of 21' RV's that get about 16mpg (outstanding when it comes to RV's I'm told). So after scouting the internet ads we opted for me to fly to Phoenix, Arizona where there was the largest collection of these RV's. And as an added bonus I was able to crash at Sherrell's childhood friend's house and they even had an extra car for me to drive in my quest. Well, I found it. And not only did I find our 6 wheeled (it has dual rear tires) WTM (white trash machine), I fixed it up, loaded it with Mirror Pond Ale, and drove it over 1500 miles from Arizona to Huatulco (not far from Guatemala). I crossed 12,000' mountain passes near snow covered 18,000' peaks in Mexico City. I crossed the desert, the forest, lakes, rivers, more mountains, more cities in an endless blur to return to Sherrell and our cats. FIVE days of day-time driving and that has to be a speed record. I didn't have a single serious break down. In fact during my rest stops I spent time fixing things inside. The only problem was a $100 in bribes to some crooked cops near Mexico City and about 37 toll booths. (I took the paid roads because they are big beautiful smooth roads with emergency service phones and plenty of help if I broke down). It was a spectacular little trip to bring our WTM to Mexico. The pictures make it look bigger than it is. This is a toyota mini-truck with a box on the back. In the box is a propane stove, a electric/gas fridge, bathroom, shower, sink, water heater, and of course the bed. It's smaller than our boat, but what the hell? This thing was built in 1986 and has retro all over it. One thing for sure is RV's and boats are worlds apart when it comes to quality. RV's are junk. But we are fixing this one up. The engine and drive train are in great shape with only 80k miles. There are some issues with the hatches and the ceiling, but we've found materials here in Mexico and are starting to fix them. One hatch blew off when I crossed the area near the Tehuantepec. Ironic isn't it? The Tehuantepec is a nasty gulf to cross in a sailboat and here the RV is what takes the damage. Got a parking spot for us?! You might have missed the little 8.8 earthquake and the media obsession with the tsunami hitting Hawaii, but other parts of the world experienced that little wave. Here in Huatulco in the southern part of Mexico we had a little surprise too. We are in a small canal off the side of the marina (I call this area "The Cheap Seats") where there is no water or power, but the price is right! This smaller area was more dramatically effected than the main marina. I measured a 4'9" height change in about 90 seconds. Fortuantely these aren't true tsunami style waves, but are just smaller waves that cause large current surges. In the smaller basin where the fishermen are near town there had some serious problems. The narrow entrance just pumped waves inside like a shotgun. Several pangas were sunk. There was a cruise ship on the dock that immediately departed for deep water. Fortunately for us all we experienced was the rushing current and the elevator ride up and down about 15 times so far today. I shot a boring little video that shows some of the current draining out of the marina...remember this water is normally at a dead standstill.